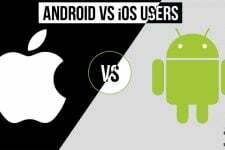 Android is the most popular OS for mobile devices that sports a variety of amazing features not found on other Operating Systems like iOS and Windows Phone. However, there are still a few things that this darling OS of ours lacks. As an Android user for years, I have always felt the acute need of a dedicated desktop management suite for Android devices and support for third-party themes. A smartphone might be self-sufficient in itself for performing various types of tasks but there are times when we wish for a desktop management tool that makes things easier, especially for those who spent a lot of time in office or work sticking to a computer. There are certain smartphone OEMs like Samsung, Sony and HTC that provide a PC Tool for desktop support but all of them are partially equipped with tools that really make things easy. This is why, the very possibility of an all-in-one tool for smartphones thrills us and this is where Moborobo comes to help. I have tested various such utilities and reviewed a few too in the past but having acquainted with all the features offered by Moborobo, I could not help being overwhelmed with it. There is hardly a thing it can’t do and therefore it a one-stop hub for all your mobile requirements whether you own an Android or iOS device, or both of them. Show detailed information about your phone with device and SD card storage details. Automatically install the required device drivers if it is not found on your computer. Shows the number of contacts, text messages, installed apps, images, music and videos stored on the device. Backup on demand or automatically and restore your phone’s data and apps to prevent data loss. Clean up the device to free more space on SD storage and RAM. Capture screenshot from the computer. Exhaustive contacts details with classified call-log entries. Manage, compose and send and receive text messages right on your desktop. Shows up the system and all third-party apps and lets you delete even system app (bloatware) if you have root access on your phone. Lets you install APK files directly from PC and adds an icon to APK files so that you can easily recognize them. Install your favorite apps and games from Android market directly to your device. This is a great feature for those who, for some reason, are not able to Play Store on their device. View the images from your device with a dedicated gallery and download thousands of new wallpapers from all over the web. Play your phone’s music and download popular ringtones. Manage, delete and add image, music, tones and video files. Access the files on your device with dedicated Moborobo file manager tool. Get notifications for new app updates. With apps like Mobo Market and Mobo Player, you can access the apps found on Play Store, daily recommendations and manage video files respectively. Saves your phone’s data plan cutting your monthly data bills by using your computer’s data for downloading apps, games and other stuff. With all these features enumerated above, you can easily understand how richly functional Moborobo is! After throwing a quick glance over the features of Moborobo, let’s now have a look at some of its striking functionalities. Our phones are costly indeed, but the data stored on it is invaluable. Getting our phone’s data back in case of accidental device factory reset, loss or being stolen is pretty much like getting back the contents of your wallet if the wallet is lost. 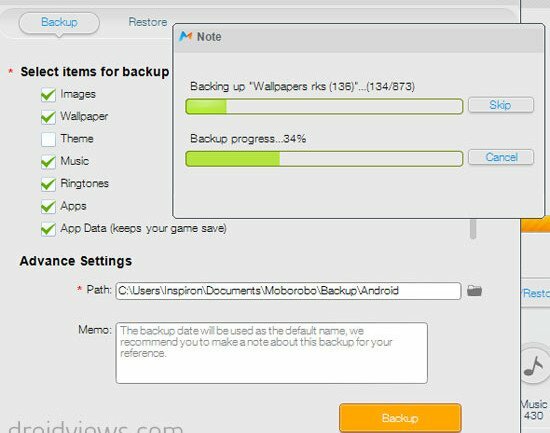 Moborobo, does the backup job so nicely that you can feel a sense of relief if anything wrong occurs to your device. It can backup your phone’s contacts, messages, call-log, images, wallpaper, music, ringtones, apps and app data and restore them back whenever you want. Either we got a new phone or an old one, the chain of installing and uninstalling app never snaps for a moment. 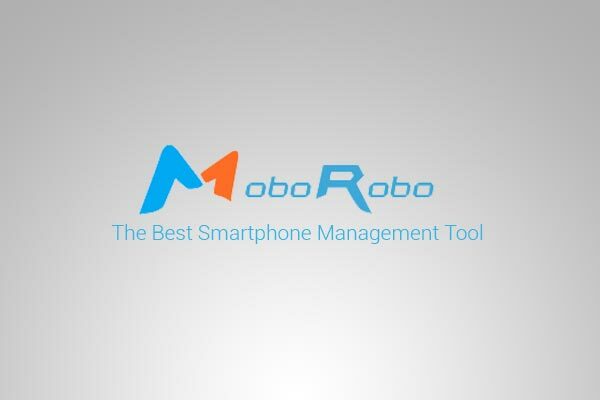 Moborobo lets you manage the apps on the device in its own way. 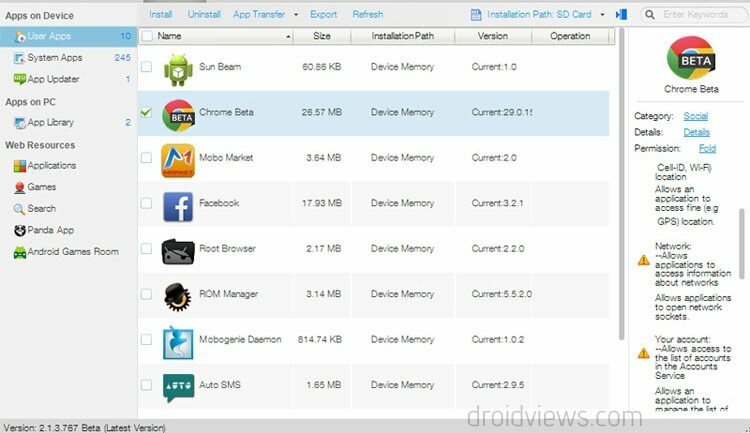 It allows you to download and install apps from the Play store directly from the PC tool which shows the complete list of system and third-party apps found on your device. Quite pleasantly, if you have a rooted Android phone, you can also clean up bloat apps very easily. The tool lets you know when an app update is available and install it at your wish. By clicking on “Permission” on the right sidebar, you can also see details, app category and complete permission rules for individual apps. Now this is really a welcome feature for those who get limited data plans on their smartphone and shirk from downloading new apps and updating existing ones for fear of exceeding the data limit. Moborobo offers a great solution! Overloaded with Android/iOS resource center, this tool lets you download apps, games, wallpapers, ringtones using your PC’s data. Now you need not worry about extra heavy data bills imposed on you. It’s an innovative feature added to Moborobo in a recent update. The idea of integrating features like file transfer and message sending from computer to the mobile device in a beautiful weather widget on desktop is really nice. This multi-purpose floating widget launches a file transfer and messaging window when you click on it. You can place it anywhere on your desktop or simply hide it to any side of screen edges. It can be launched any time by hovering the mouse pointer on the knob. What is a smartphone without contacts? All of us store hundreds of contacts but when it comes to managing them on phone, it really feels a tiresome job. However, the same task becomes quite easier when it is done via Moborobo on your desktop computer. You can not only edit, add and delete contacts but also backup them so that you never lose them. 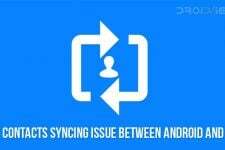 Since Moborobo supports Android and iOS both, it can easily transfer contacts between the 2 platforms in a few clicks. Finally, before we finish this review of this must-have tool for Android and iOS users, we would like to recommend it to all our readers. When it comes to a desktop based management tool for both the platforms, Moborobo outshines all. How about not making the download link to the file we actually want a tiny little text link and making all of the adware download buttons so huge. Now I have to go delete the adware I got tricked into. Adware? Here is the tool. Now how do I get rid of Zip Opener, which I downloaded from this page. When I go to control panel and try to uninstall it, it opens a popup which only gives one option, which is to remove it from the uninstall list (cleverly worded to sound like you are uninstalling it). It also installed its own search engine. It was one of the ads – disguised to look like the download link. Seems they have added the adware recently. You can remove the search engine from your browser’s Settings. To remove the Zip Opener, go to Program Files, find the folder for the program and remove it. I’ll give that a go. I ran Spybot SD and am running Malwarebytes now. I should have known any kind of downloader utility is probably malware. I wish I could get my hands on just one of those bastards who write that stuff – maybe it’s better if I never do. Not when they make it impossible to uninstall it. I can’t uninstall it from Control Panel, and I can’t find it in any of my program folders. That is malicious and dishonest. I have no tolerance for subterfuge. This is not a “Cross-Platform Desktop Utility”. This is a single platform desktop utility. It runs (only) on Windows. Right, but Android and iOS are also platforms!